Pocket folders are an excellent way to organize loose pages and create better presentation for reports, marketing packages and information kits. Pocket folders provide a durable way to organize papers and come in different configurations. 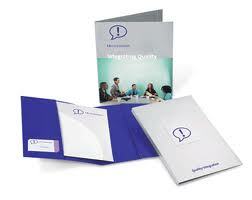 For standard letter-size documents, choose the 9″ x 12″ option which allows a 1/2 inch overhang. For standard legal size documents, choose 9″ x 14.5″. Slits for inserting business cards can be on the left, right or both sides.